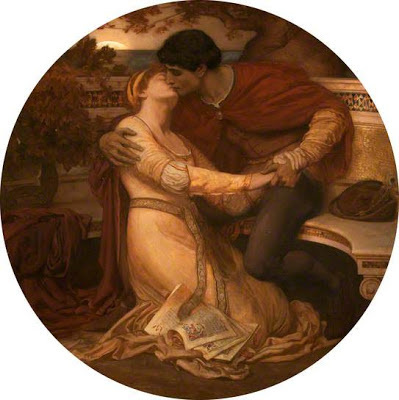 There are moments of life and art collision with Rossetti, and his early love of Dante and the story of Paolo and Francesca (possibly form the work of Leigh Hunt) has some tempting echoes in his later life. In 1855, possibly our young painter still regarded himself as 'Dante' the observer, the recorder of other's folly, other's doom. Later, Rossetti became the doomed Paolo, falling for his brother's wife, straight into the whirl-flames of the Inferno. 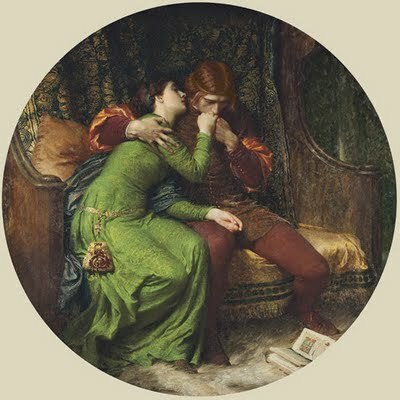 Planned and executed before the trip to Oxford, Rossetti shows us the couple brought together adulterously over an image of Lancelot and Guinevere, then locked together in the hell of their own making. 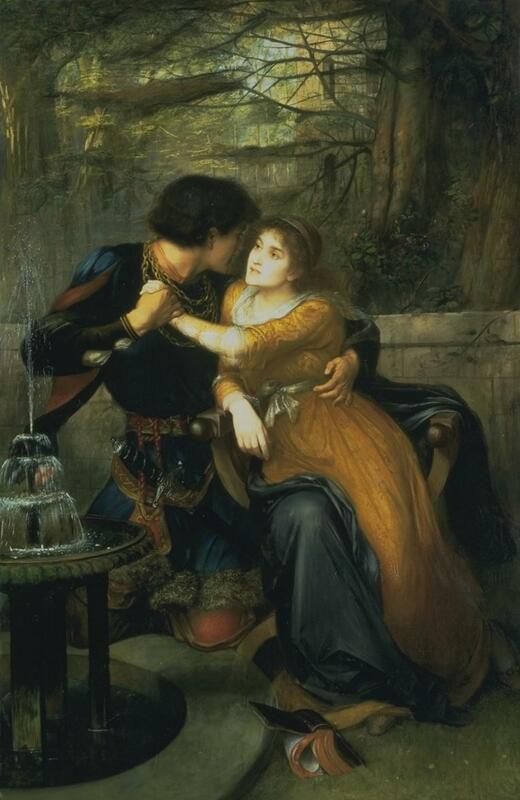 Soon after he would meet a stablehand's daughter, cast as Guinevere and lulled into marriage with another man. Did Rossetti know how much his love of Jane would cost him? You will remember I used this image a couple of weeks ago, and it was this gorgeous moment of drama which really set me on the path to learn more as I adored the paleness of the scene, the stillness of the moment, cruelly mirroring the passion that has ended. To give you a short version of the story, Francesca was offered in marriage to the eldest son of an opposing family in an attempt to end a long war between them. Although the eldest son, Gianciotto was sure to be a capable ruler in his father's stead, he was ugly and deformed, unlike his rather handsome and lovely younger brother Paolo. It was pretty Paolo they sent to woo Francesca, who only learnt of the deception on her wedding day when the other man stood beside her at the altar. 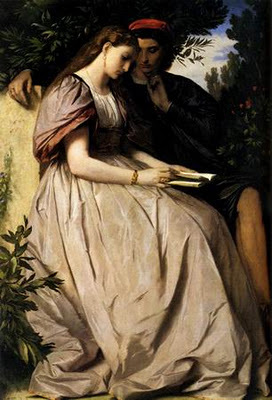 By this time she and Paolo were very much in love and spent time together as brother and sister, reading a book about King Arthur and the knights of the round table. 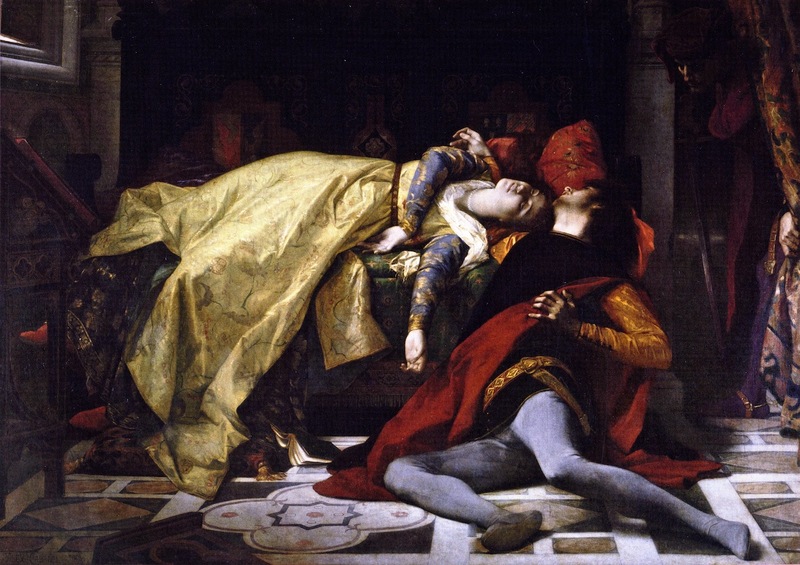 They finally consummated their passion over the story of Lancelot and Guinevere, but were caught by Gianciotto who attempted to kill his brother. Francesca threw herself in the way of the blade and was killed. Gianciotto then killed his brother and the lovers were buried together. 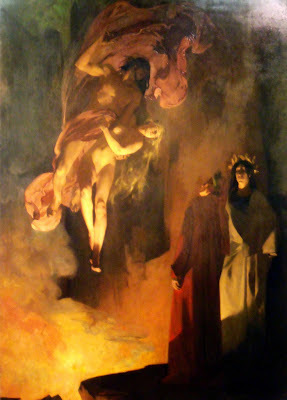 Dante who was a contemporary of the families included them in the Inferno, in the circle that dealt with lust and consequence. The light hitting Francesca's face is lovely, highlighting her shining love for the young man. The book is forgotten and the only thing in the whole world is their love. They sit together, not looking at each other but the space is compressed making you feel their embrace is inevitable. Her skirt fills the canvas, catching the light and seeming to confine her to her seat as the shadow-cast figure of her young lover guards her. Her attention is on the book, his attention is on the book but their awareness of each other is undeniable. They embrace, but he kisses her fingers rather than her lips. 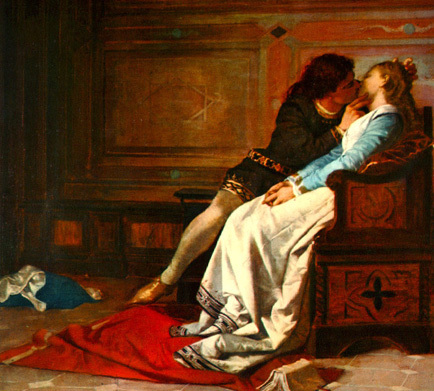 In the Inferno, Dante describes Francesca admitting that as they read about Lancelot, 'This one, who ne'er from me shall be divided, kissed me upon the mouth all palpitating.' I love the richness of their dress and surroundings. There is a wealth of luxury from the silk of her dress to the fur beneath their feet and yet it will not save them. Possibly the most dreamy image of the couple comes from Christopher Williams' Edwardian wonder, the circular nature of the story reflected in the form of the canvas, as the story of the adulterous knight falls to the floor as the adulterous couple form a circle with their arms. Behind them, the sun is already setting but the couple are unaware of how late it is and that their lives are almost over. Very few of the paintings cover the actual death of the lovers. 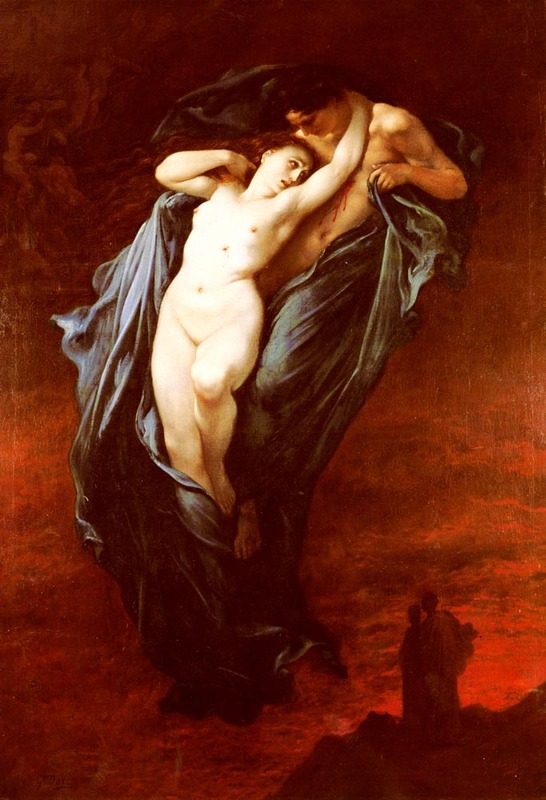 The one by Gaetano Previati and this one by Cabanel show the pair together in death, their powder-pale skin whispering death from the canvas. 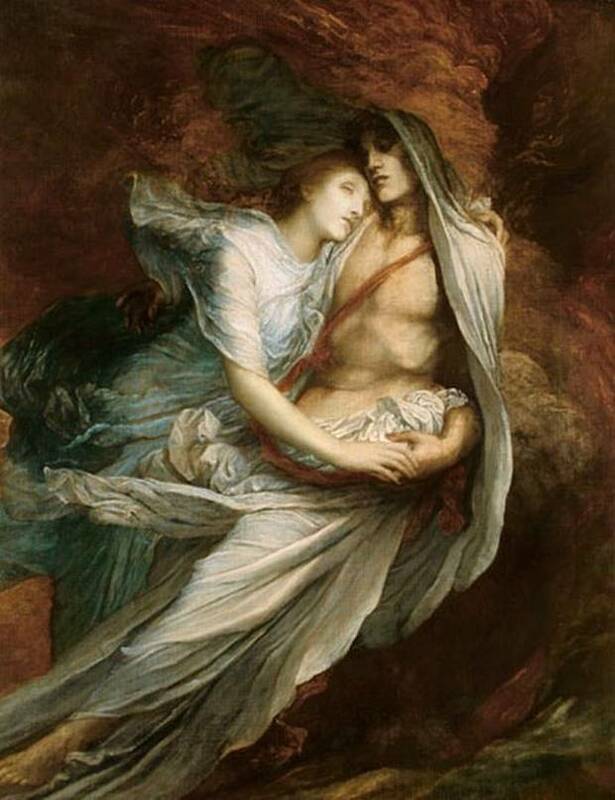 They reach for each other, cling but death has made their embrace futile and incomplete. I love the shimmer of marble on their flesh, reflecting the beautiful floor where Paolo lies in an agonized contortion. Like Rossetti, many artists liked to show the lovers in the context of Dante's vision of Hell. This gives rise to some complex meshing of emotions. The couple cling together, forever united, but spinning in burning hell of their adultery. 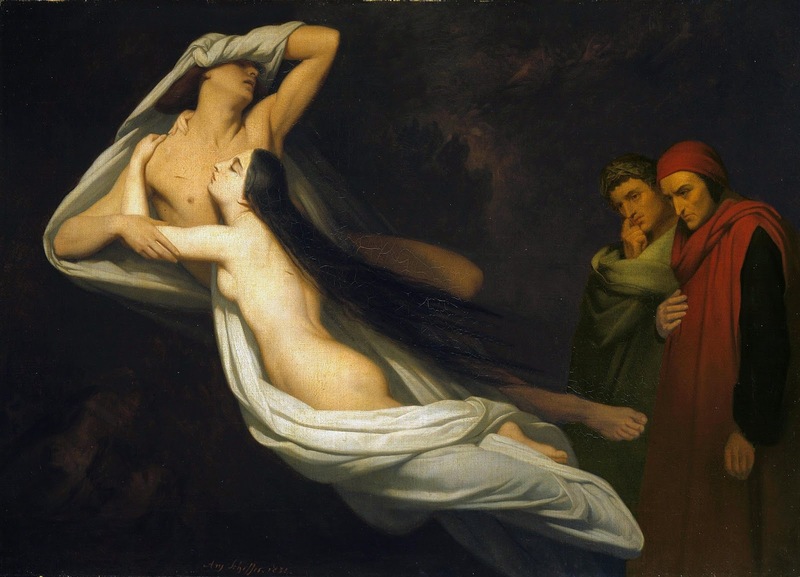 There is no hint that their deaths may have been punishment enough; Dante's vision see torture unending for their indiscretion, an unworldly judgement on the couple. 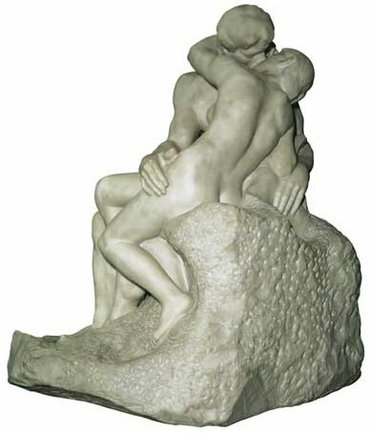 There is a sort of subversion of their fate in that they cling together, but even this may be a cruel parody of their lover's embrace. While chastely clothed in the images of their love, in death they are stripped, Francesca's skin shining in the gloom of Hell. The figure of Dante echoes our own pity for the couple as he finds the couple so sympathetic, he faints to see Paolo cry as Francesca describes their circumstances with much eloquency. 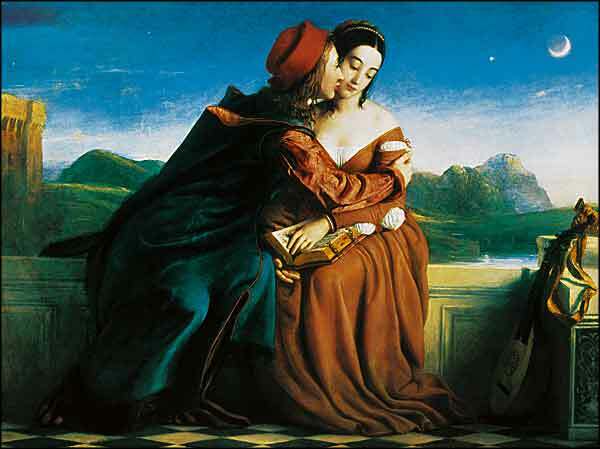 It is suggested that Dante may have even met Paolo in real life, shortly before the marriage of his brother to Francesca. His pity for the couple does not save them from the flames of Hell, a very moral judgement, but he cannot help put feel their pain and be affected by their suffering. The fate of the lovers is both bleak and complete. They spin together in either fire or a gloomy nothingness, clasping each other in love and torment. It is tempting to see their punishment and Dante's horror and empathy as our own dual-nature response to violations to our moral codes. We set rules for ourselves and for our civilised society but if the perpetrator of a break in the code is sympathetic enough, we cry with Dante. It also speaks of a feeling of unending punishment for such a violation. Their earthly death is not enough, they must burn for all eternity as we watch them, the terrible warning. It strikes me as fascinating that when Rossetti envisioned the scene, he saw all aspects. He saw the kiss and the burning, and in the centre, regarding it all was his namesake. How closely did he identify? 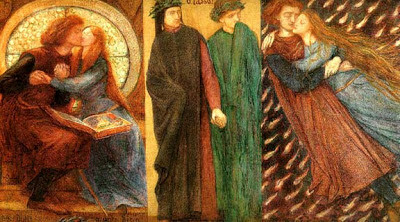 It is often said that Rossetti identified with Dante and Beatrice, morphing her from Lizzie to Jane, when death stole the former. What of his identification with Paolo? It would be tempting to see his torment at his adultery begin on earth, but William Morris did not kill them, nor did Jane cling to him in death. 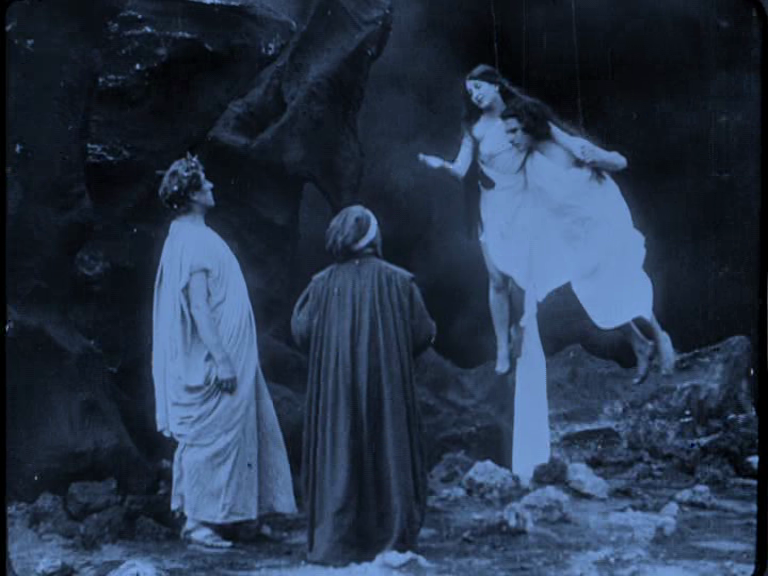 Rossetti was just left as both Dante, recording the punishment and Paolo, turning alone in the Hell of his own making.